Welcome to GROHE Sense, the innovative water sensor! The GROHE Sense Extension Set boosts the range of the GROHE Sense device (22505LN0) – which you buy separately – with a sensor cable that fits easily into difficult to reach spaces such as under a washing machine. The cable is 1.2m long and attaches to the sensor, which can be mounted on a wall so the blinking red light is easily visible. The technology packed GROHE Sense detects the first signs of unwanted water as well as measuring temperature and humidity. If it senses a flood then a red light flashes on the glossy acrylic plate and a buzzer sounds so you can act immediately. And, as it is Wireless LAN-connected, it sends an alert to your smartphone by push notification via app or email. It is quick to install. Just attach GROHE Sense to the extension set, mount it on the wall and place the attached remote sensor on the floor. Then download the GROHE ONDUS app, register, follow the simple step-by-step instructions, and in less than ten minutes you are protected. Get daily updates of the temperature and humidity measurements so you can act to reduce the risk of condensation or frost. To ensure your home is fully monitored – from the luxury family bathroom to the hard-working utility room – you can add other products in the GROHE Sense range. Stylish and user-friendly, GROHE Sense is the industry-leading way to create complete confidence in your home safety. GROHE Sense: Before a drip becomes a flood! 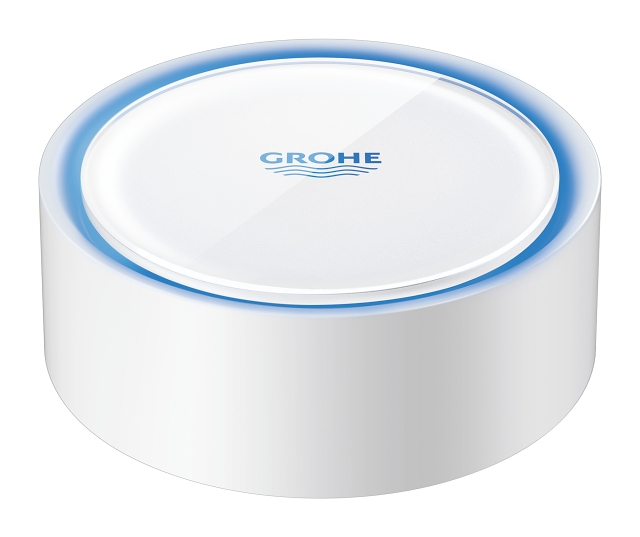 Welcome to GROHE Sense, the innovative water sensor that protects your home against water damage. The GROHE Sense Extension Set boosts the range of the GROHE Sense device (22505LN0) – which you buy separately – with a sensor cable that fits easily into difficult to reach spaces such as under a washing machine. The cable is 1.2m long and attaches to the sensor, which can be mounted on a wall so the blinking red light is easily visible. It is quick to install. Just attach GROHE Sense to the extension set, mount it on the wall and place the attached remote sensor on the floor. Then download the GROHE ONDUS app, register, follow the simple step-by-step instructions, and in less than ten minutes you are protected. Stylish and user-friendly, GROHE Sense is the industry-leading way to create complete confidence in your home safety!